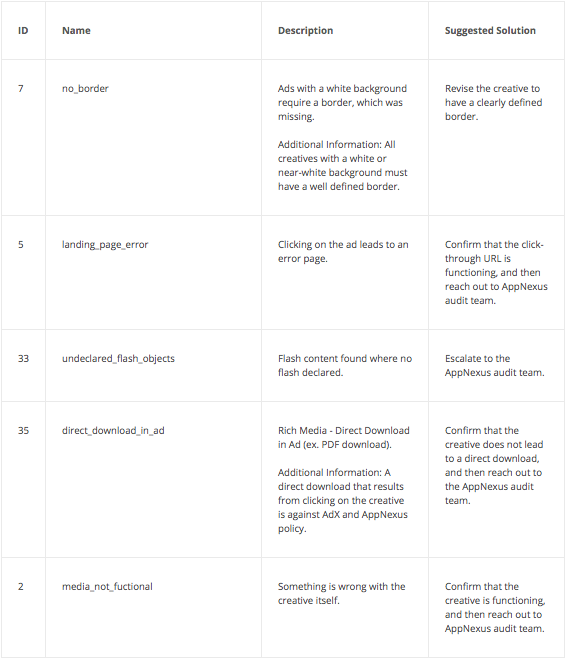 In order for your creatives to serve on Google Ad Exchange (AdX) and AppNexus inventory, they must pass the human audit, as well as be approved by AppNexus' and AdX's automated auditing systems. Yieldr handles submitting your creatives to the audit queue and programmatically retrieves the approval status. 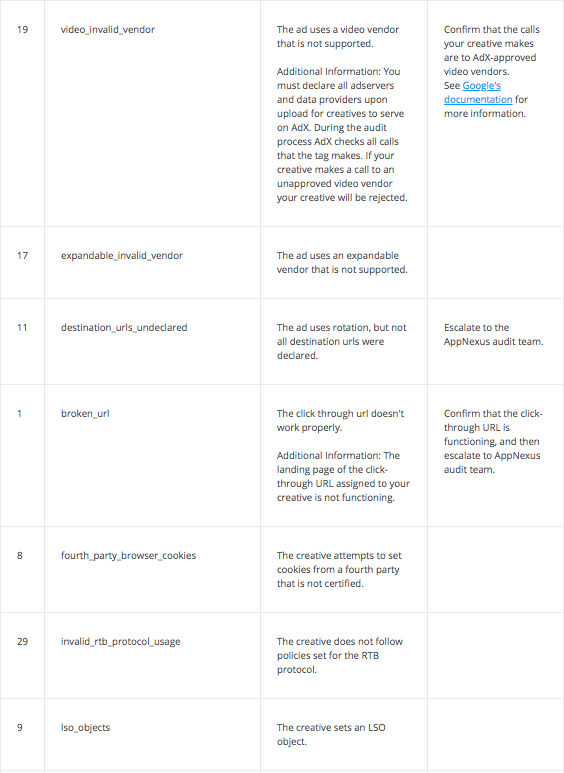 You can find the audit status of your creatives within the Yieldr Ads platform under "Advertiser Name > Creatives". Simply hover over the green icons under the column "Audit Status" and the pop up will display the status of that creative size. 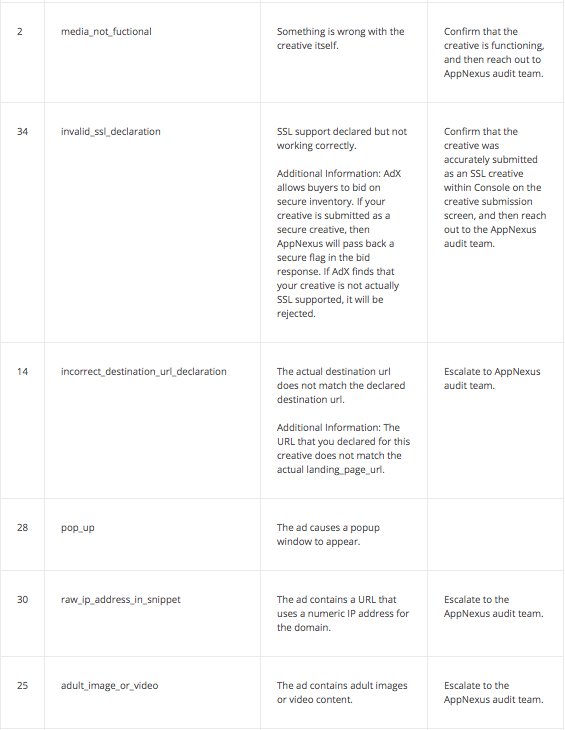 The "Audit Status" will reflect the AppNexus audit status. See the Creative Standards and Auditing article for more information about AppNexus' standards. 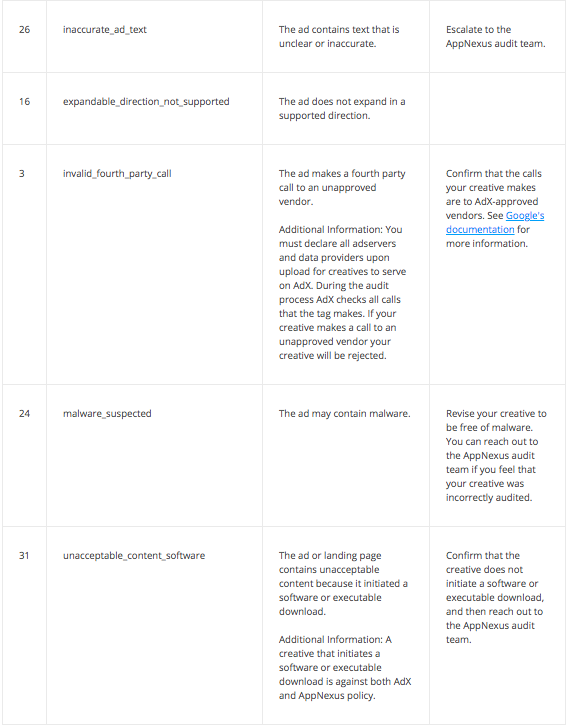 Creatives with an approved "Audit Status" can serve on AppNexus inventory. The Google "Audit Status" will reflect the AdX audit status. 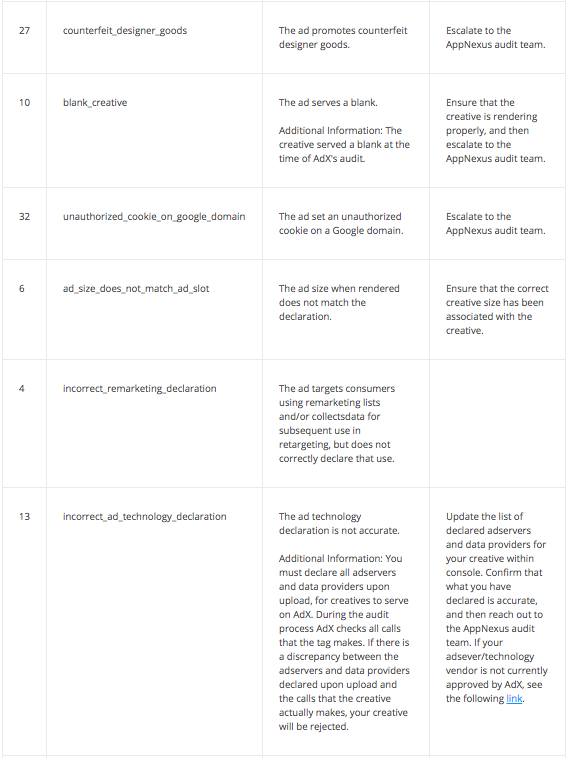 See Google's Ad Exchange Policies for more information about AdX's standards. Creatives with an approved Google "Audit Status" can serve and bid on AdX inventory. 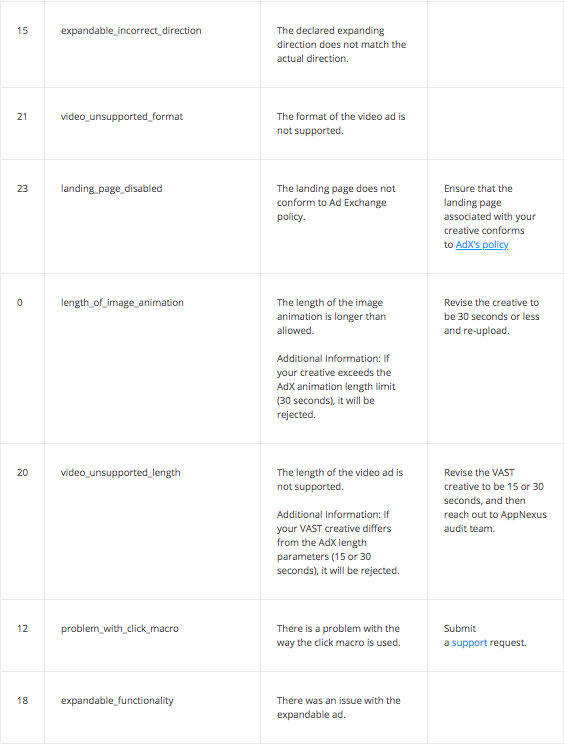 If your creative is rejected by the programmatic Google AdX audit, a rejection reason will be provided. Consult the table below for information on how to correct the issue and pass the audit. This current list of rejection reasons has been taken from Google's documentation. You will be provided with a rejection reason if your creative is rejected by the AdX audit. Find the reason that was provided within the "Rejection Reasons" table above and review the description, additional information, and suggested solution. Once you have an understanding of the issue that the audit found, review your creative and it's settings to confirm the validity of the rejection. If your creative does not comply with the Ad Exchange Policies, revise your creative to meet the necessary requirements. Revision could involve modifying the creative file itself, or settings associated with your creative that are made within Console or via the API. See the suggested solution column in the "Rejection Reasons" table above for reference. Once you have revised your creative to meet the necessary requirements, or determined that it was misaudited, submit a support request to the Yieldr Support Team.